When we will start calling things by their name?! 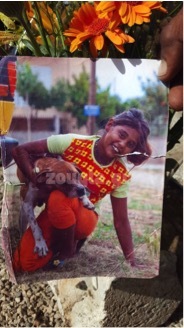 A man kills a Roma girl in Amfissa, Central Greece: Racism?! When we will start calling things by their name?! Greek media reported: “Local businessman shoots and kills 13-year-old Roma girl in Amfissa, Central Greece” on Monday, June 4, 2018. One of two available articles in English acknowledges the existence of racism in Greece, but only in one sentence and at the end of the article. But what is lacking is not only the ignorance of Greek media of the extent of antigypsyism in the country. It is shocking to read that “the motive of the shooting remains unclear”. The motive of the shooting is clearly antigypsyism. The media talks about the murderer as someone who used to always drive faster when passing by the Roma in Amfissa. He then approached Roma and simply fired bullets in their direction. The media even go further to implicitly suggest that Roma might be guilty, speculating about a gossip that Roma might have stolen something from the shop of the murderer. This is how the media reproduces racism. They also reproduce racism by not calling things by their proper names. Antigypsyism is not only what is being said or done, but also what is not being said or done. Most parts of the available English language media articles are focused on the “tension in the area”, which is “high as locals fear of revenge and members of the Roma community have already set the perpetrator’s car on fire and damaged his shop”. The main message that the articles about the case send to the public is putting the blame on Roma since they create tensions. This shifts the focus from a tragic loss of life of a young girl to a typical imagination of the Roma communities. ERGO Network calls upon the authorities to properly investigate the case and punish the perpetrator for committing hate-crime against Roma and to prevent filling the society with fear of Roma. We also demand the protection of the Roma community in Amfissa by the Greek authorities as well as respect for the Roma members of the Greek society. The European societies, including Greece, have to start acknowledging antigypsyism and make concrete steps to demonstrate that the phenomenon should not be accepted. We welcome the statement of the Greek Government that acknowledges that “the tragic event  was not an accident or the result of a ‘bad moment’”, but it “brings back to the scene the huge racism, stereotypes and hostility against Greek Roma, as well as the difficult conditions in which most of them live”. “Meanwhile, on social media, dozens of Greek racists spew hate against the Roma and some even hail the child’s murderer. The decline of a part of the Greek society is getting frightening”.